It was officially the weekend and the second day of my extended break from work. Many people had been out the previous day to sample the fresh and falling snow. 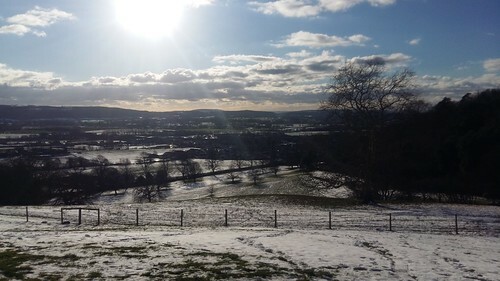 Again, I hesitated over whether not to go out again, as I’d seen enough snow and was planning to walk the next day… As cabin fever began to set in, I found myself climbing those hills from home again. 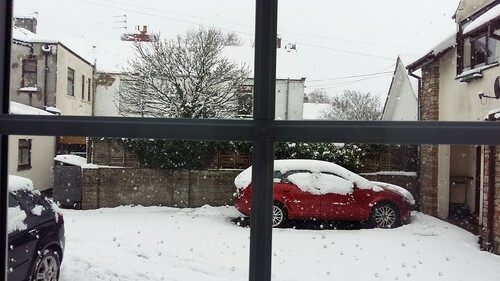 I forgot to share these first two photos in my previous post but this was the view from my bedroom window, a few hours after waking up on Friday morning. Then here, from the living room/kitchen space window. 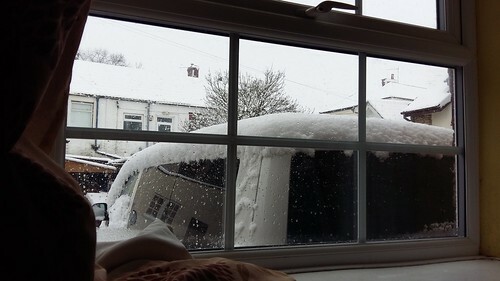 Partially obscured by a neighbour’s van. 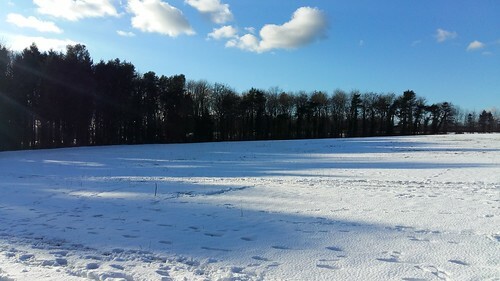 At very first glance, I thought the snow had piled very high! 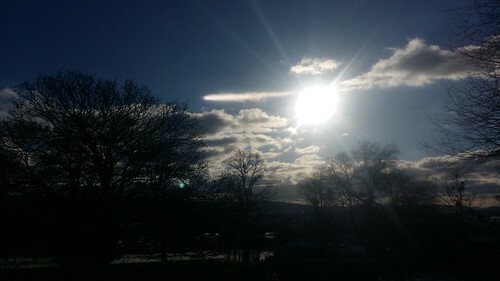 If there was one feature that would define Day 2 from its predecessor, it was going to be the sun. Shining bright and high amongst those sparse clouds. 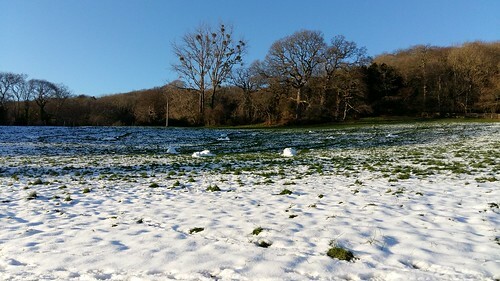 With the risk of melting snow, there was also a good chance that this warmth would clear some of the early morning ice that had the area labelled with a Yellow Weather Warning. 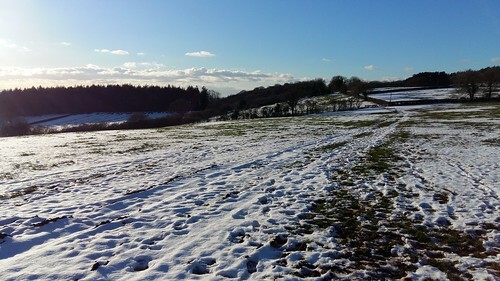 As on the previous day, I made my way up Old Hill from School Road and this time, on to the public footpath that crosses Barley’s Farm. 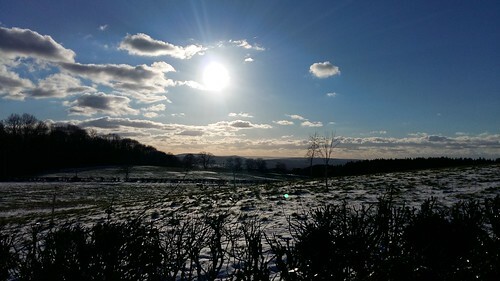 While the roads in Wrington beneath me had cleared, there was plenty of winter to be found up on the hills. 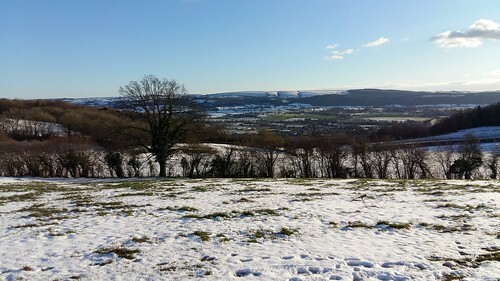 From one of my favourite viewpoints overlooking the village, I could see the snow-capped summits of the western Mendip Hills, where I hoped to be walking the very next day. That gift of sunlight almost adds an extra dimension to every scene. All of the photos in this post were taken using my phone and I’m very pleased with the results. It was past lunchtime and getting on for mid-afternoon, by the time I’d decided to brave any remnant ice and get out there. 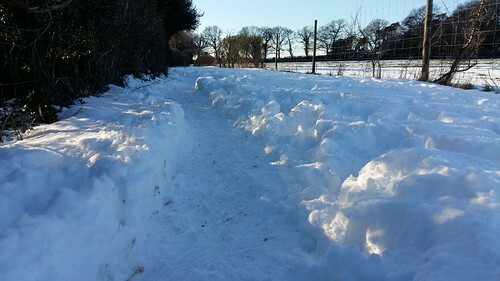 Previous snow-goers had worn a trench through this stretch beneath Meetinghouse Farm. 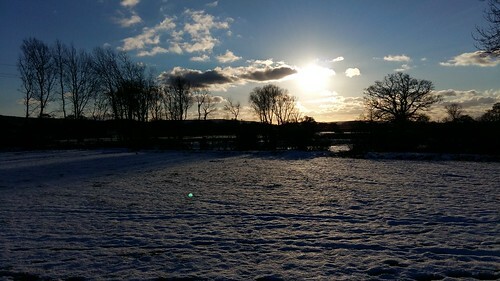 As if the snow wasn’t magical by itself… Sunlight can be a very rare sighting in your typical British winter. Also in the summer, as some may tell you! 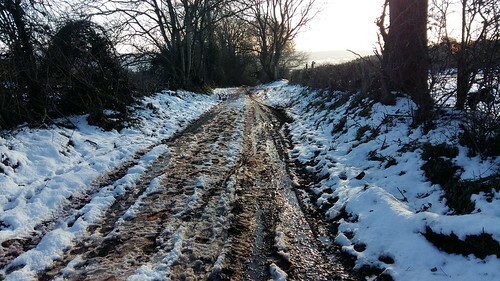 I crossed Wrington Hill once again, where snow and ice had pretty much abandoned the tarmac. From Ball Lane, I followed a series of field paths towards the woods – a familiar stretch of one of my regular summer evening routes. 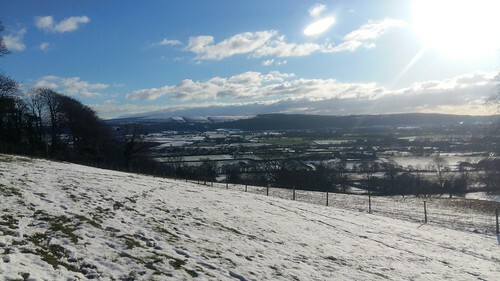 Another desirable view of the Mendip Hills and Black Down. Wondering. I bought this mostly with vlogging in mind. Maybe the odd self-portrait. While this is my favourite of all I took at the time, I have to say that it’s surprisingly hard, at first, to line the shot up as you desire and even to make small adjustments. Those people you see ‘taking too long’ to capture their own image… They’re probably struggling with this as well. A series of three new metal kissing gates were recently installed by Woodspring Ramblers, on this stroll towards the woodland. It’s a good thing for us all, that we can say goodbye to those awkward and well worn wooden stiles. 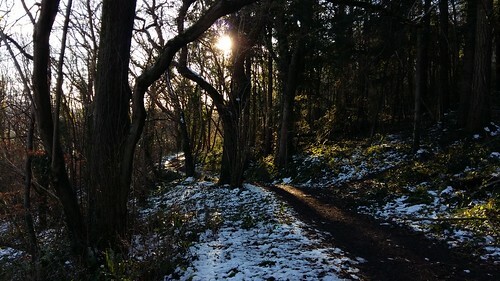 Entering the comparatively dark woodland, I found the path beneath my feet was not as slick or ice-laden as I’d anticipated. 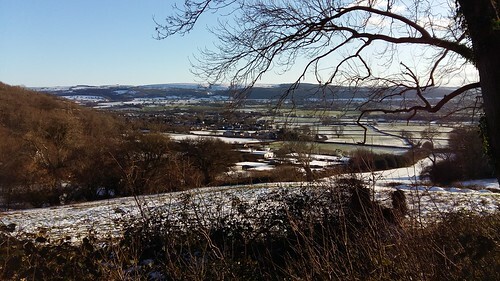 A view from the trees, towards Wrington, the vale and with the Mendips beyond. 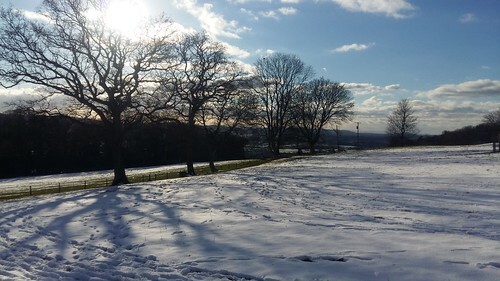 I held in hope, the idea that much of the distant snow would remain for just one more day. 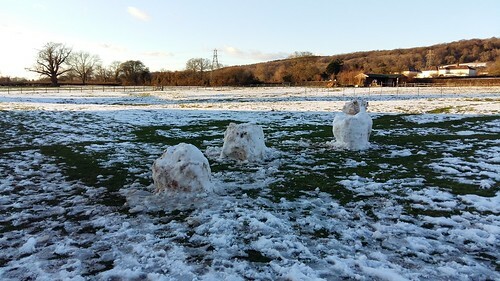 All snowmen must meet their demise. 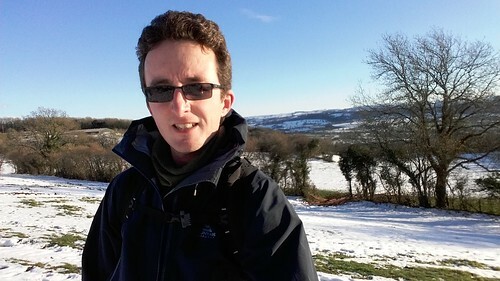 I returned to the Two Rivers Way, as my guide back in to Wrington. 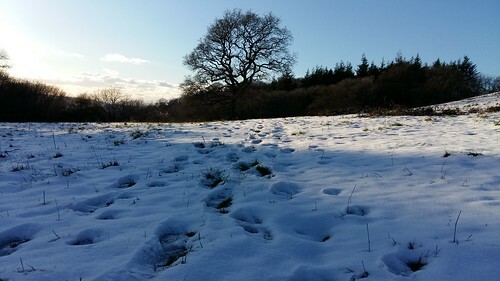 Much of the snow at this lower level had already gone, as the sun slipped out of view. 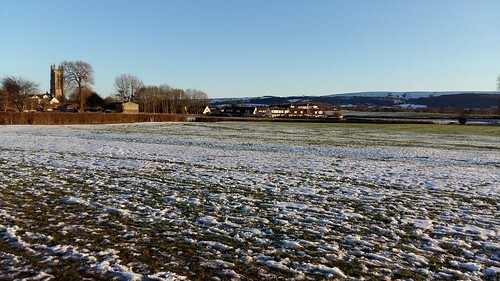 With barely a cloud in the sky and the wind speeds certainly reduced, I could clearly see the line of those hills. Unlike the same misted view from twenty-four hours earlier. 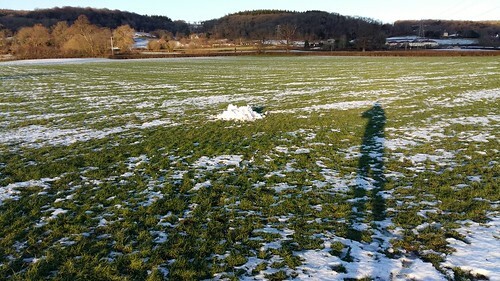 I’ve had this thought where, the next time we receive a decent snowfall in this part of the UK, I could head out and build a scaled-down ‘Snow Henge’… I’m sure Google would tell me it’s already been done. One more day of snow and blog post to come. Possibly the best experience yet! 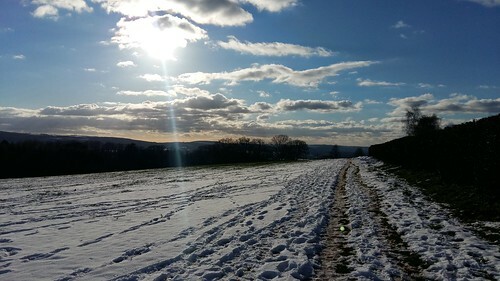 This entry was posted in North Somerset and tagged hiking, landscape, Mendip Hills, North Somerset, outdoors, Snow Day, Snowmageddon, UK Snow, Walking, Wrington on 06/02/2019 by Olly Parry-Jones.